Decepticon Operational Status Update, reported by Soundwave: Decepticon Off Road is the newest member of the Stunticons, and whilse he's a “necessary evil” for the Stunticons to combine into their gestalt form, the rest of the crew aren't sure they totally trust their new teammate. Exuding complete confidence and deadly charisma, he stalks his opponents with unyielding tenacity. 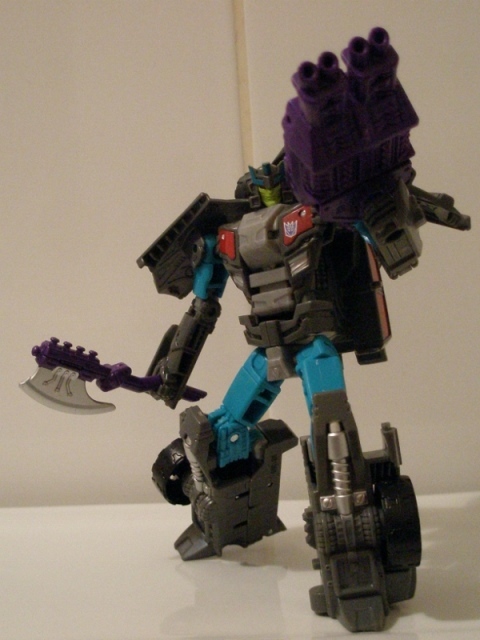 His figthing style is exacting as it is ruthless, spinning his Energon hatchet to deliver terrible damage with frightneing efficiency. His vehicle mode lives up to his namesake, just as comfortably tearing down the highway as turning directly out of it. With fellow Stunticons, forms Menasor. History (extracted from compulsory biographical download): Decepticon Off Road was handpicked by Motormaster to replace a fallen Stunticon. The other teammates have been slow to accept him, mainly since he was instantly at ease in his new role. Even worse, why has he chosen to emulate the colours of the fallen Stunticon? Is that tribute of sacriledge? Only Decepticon Off Roadknows for sure. 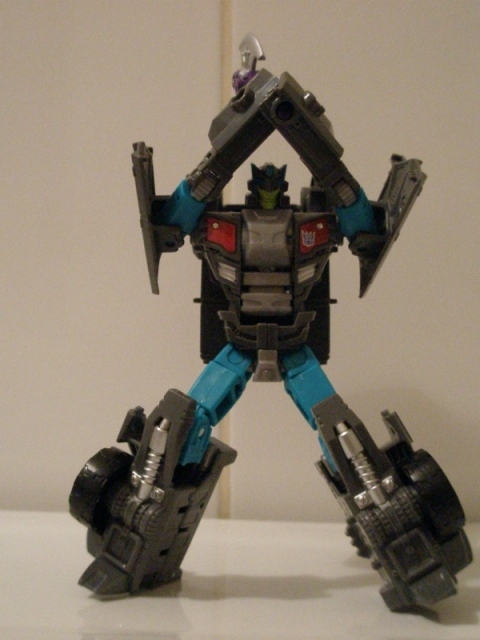 Forms either an arm or a leg of Menasor, the combined form of the Stunticons. Decepticon Off Road is another neo-classic character in the vein of Alpha Bravo, done up in some familiar colours in a 'please accept me' fashion – in this case borrowing “the fallen Stunticon” colours to fit in with his team. As a result, any plus points the toy and character might have had are slightly overshadowed by a bio that whiffs of over compensation for this not being the expected slick sports car Terrorist, Wildrider. Its strange to put out a perfectly acceptable figure that adds something new to the mix with a massive apology. I suppose Hasbro are mindful of the rabid hoards that froth on various message boards when something doesn't suit. Bit of a shame really, as Decepticon Off Road is pretty damn cool. 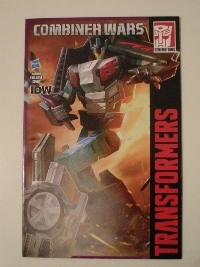 The 'free' comic pack- in is a random chapter of IDW's Robots In Disguise ongoing from over two years ago and so has no real relevance to the toy. It's also by turns dull and awful, featuring as it does the reveal of the Prowlestator. 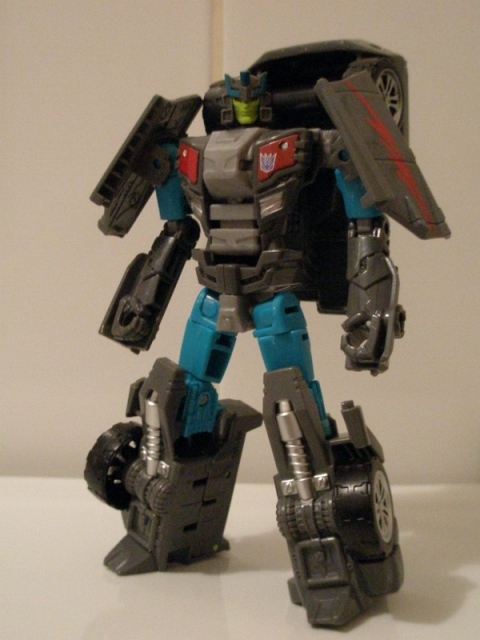 Robot Mode: A lean, athletic looking fellow, Decepticon Off Road has a lovely stretch of metal for a body. He's got these lithe arms and bouncy looking legs, all springs and wheels. Even stood still, he looks like he's about to burst into action, whirling his hatchet about. There's clearly something of the balletic show off about him. There's something in that head sculpt and those beady little eyes that makes you aware this guy could could go off at any minute. He's one of those toys that seems to have bags of potential energy stored up in him. I love his head which is packed full of character - he has a face plate that looks like it splits right back to where the jaw connects to the skull – like all the best Alex Milne drawings of bad-asses do – and these evil little eyes, all surrounded by this hat of vents and horns. The yellow's a bit sickly, but works well against the grey, red and turquoise on display elsewhere. I think what spoils him slightly is that's he's not the handsome black of his fancy photo-shopped publicity stills, and is instead this rather flat grey colour. It works to mimic Wildrider (if you must), but if he'd come out in those darker hues, the secondary colours would pack much more visual punch than they otherwise do. The only other bad thing is the stupid flap of car behind his head that gets in the way of that samurai-like shoulder armour. 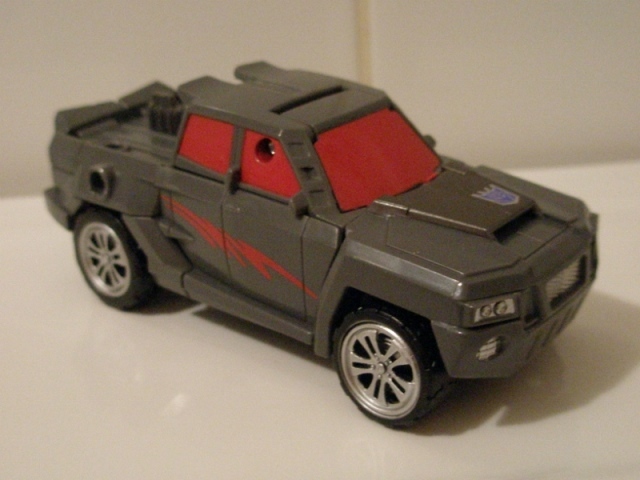 Alternate Mode: Decepticon Off Road's vehicle mode is this rather nice looking pick up truck. Being a Stunticon, his design has some nods to being sporty with the rear wheels suspended higher than the front, with the door trims down the sides also giving a slightly sloped look (which looks really weird when looked at from the side). They're design ticks I don't really care for, but it doesn't diminish how tough this thing looks. The front is nicely detailed with loads of blobs of paint to pick out the headlights and grill. The sea of grey that characterises the vehicle mode is okay, and they've kept the lighter tone Wildrider had on the hood as well as the blood red windows. Sadly, the swooshes of red down the doors just look a bit rubbish and the very back of the truck looks a bit messy with his toes poking out. The cheap construction continues to hamper mobility, with him not being able to roll very far and sounding horrible as he does move about. As ever, there's a number of weapon ports so you can clip on his hatchet and fist gun for the Attack Mode, but Decepticon Off Road somehow manages to look terrible and even worse than Dragstrip when he's tooled up. 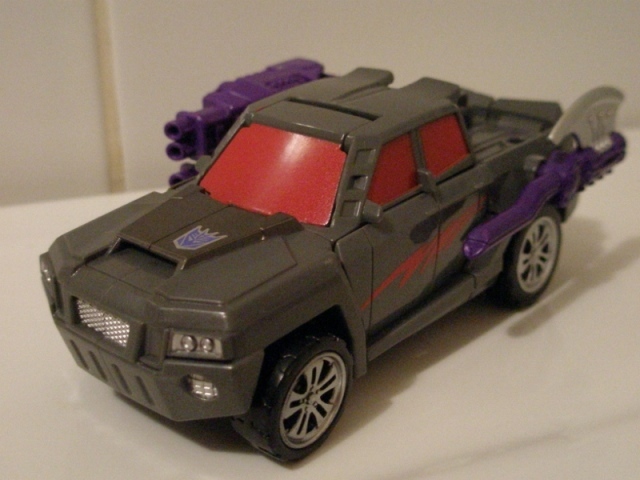 There are also a couple of ports and a mysterious nubbins in the truck bed which Decepticon Off Road cannot make any use out of and seems to sign post the inevitable mould re-use as Swindle. IMPORTANT INFORMATION UPDATE FROM TANTRUM INDUSTRIES (BECAUSE ANGER IS AN ENERGY): The fisty gun can plug into the nubbins in the truck bed- thanks to a slot in the knuckles on the fist - and form a mahoosive engine block that looks both awesome and very silly, as it is purple.